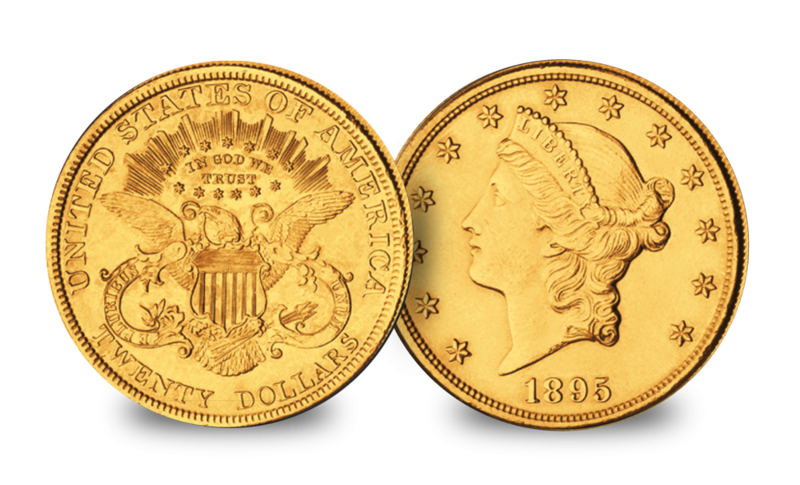 The $20 Liberty Gold coin has been previously called the child of the California Gold Rush. In 1848 California became flooded with gold as a result of the California Gold Rush – more gold than they had a use for. James Iver McKay, a North Carolina congressman, came up with the idea of a $20 gold coin made with almost an ounce of pure Californian gold - this made it twice the size of any U.S gold made before this time. This idea by McKay blossomed into one of the most significant coins of its era, however, it came to an end in 1933 where vast quantities were sent to be melted. Only a few were spared which makes this a highly remarkable and important piece. The design combines two of America’s most iconic symbols: Lady Liberty, shown wearing a coronet inscribed with the word LIBERTY and surrounded by thirteen stars representing the original British colonies that declared their independence in 1776, and a bald eagle with outstretched wings, a shield, arrows in one claw and an olive branch in the other, indicating a desire for peace but a readiness for war. A potent reminder of the riches of the 'Wild West' and, weighing over 33g, this is one of the most impressive gold coins of all time.